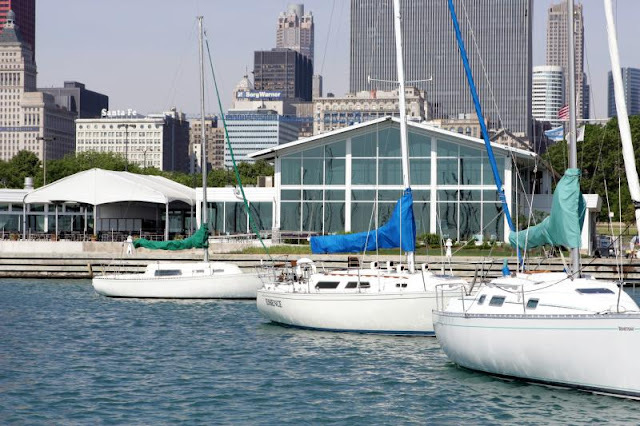 November 30, 1929 –Ground is broken for the new home of the Chicago Yacht Club at Monroe Street and the lakefront as 200 members witness the ceremony. George F. Getz, the building chairman, says, “Here will stand the finest yacht club in the world. Chicago will be proud of the structure.” [Chicago Daily Tribune, December 1, 1929] A telegram from the head of naval aviation, William A. Moffett, is read in which he “lauded the organization and congratulated the club on its activity.” Judge C. C. Kremer, who holds membership number one in the club, is also introduced to the gathered crowd. Actual construction is expected to start on March 1, and it is hoped that the club can be in the $2,500,000 building by January of 1931. The new eight-story clubhouse is to replace an older building, built in 1902, that had sat at the foot of Randolph Street until it was moved to Monroe Street to facilitate the construction of the outer drive. Optimism quickly faded as 1929 turned into 1930, however – the timing couldn’t have been worse as the stock market crash in 1929 ended the plans for the new building. In 1935 a display home at the Century of Progress World’s Fair, “The House of Tomorrow,” is moved to the site as a temporary clubhouse. It isn’t until 1955 that construction is finally begun on the first section of the clubhouse on its present site at the foot of Monroe Street. November 30, 1976 – Isamu Noguchi dedicates his outdoor sculpture at the Art Institute of Chicago, a monumental piece standing on the east side of museum, facing Grant Park. The fountain, commissioned to celebrate the bicentennial of the United States, is made up of two 40-foot pieces of granite and stainless steel, one horizontal and the other vertical and V-shaped. The forms are set in a reflecting pool that will allow year-round operation. The $250,000 piece is another sculpture that comes from the Ferguson Memorial Monument Fund. Naguchi says, “I am always astonished that things work so well in Chicago when they don’t seem to elsewhere. Chicago has always been a great place for me. This is a very happy day in my life.” [Chicago Tribune, December 1, 1975] At the dedication it is also announced that the Chicago Park District has passed a resolution to place a monumental outdoor sculpture at the northeast corner of Fullerton Avenue and Cannon Drive. Eventually Ellsworth Kelly would be chosen for that work. In 1981 his Curve XII, known as his “I Will” sculpture was installed at the location named five years earlier. Naguchi may have jumped the gun on his amazement that things work so well in the city. His work, as one can see from the photo above, is not working all that well and seems to have been largely forgotten. November 30, 1951 – At a meeting of the Irish Fellowship Club of Chicago at the Morrison Hotel proposals are put forth to bring the only Nazi submarine ever captured at sea to Chicago. The plans have the United States Navy towing the U-505 from Portsmouth, New Hampshire, where it is anchored, to Chicago, where it will be placed on a foundation near Buckingham Fountain. Jack Foster, a naval reserve officer, tells the crowd that a Chicagoan, Admiral Dan Gallery, commanded the anti-submarine task force that captured the German U-boat and its top-secret codes and that makes Chicago the appropriate final resting place for the captured sub. The head of the Irish Fellowship Club, Dunne Corboy, appoints an engineering consultant to head a committee that will study the proposal. 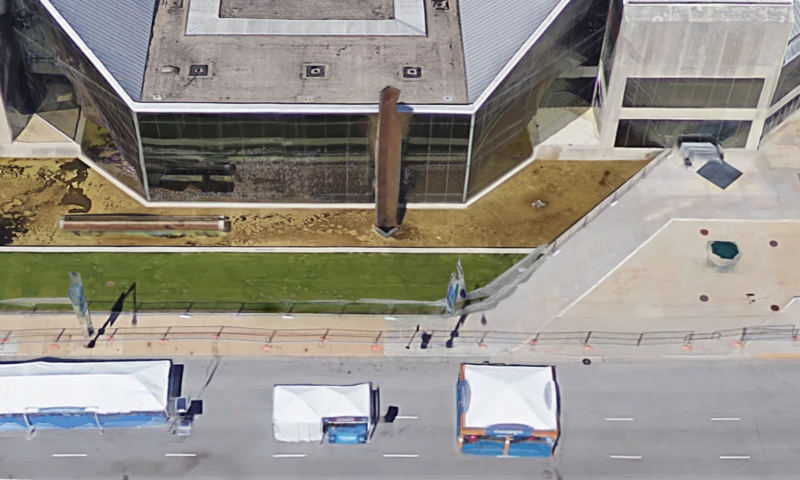 The new effort comes after the Science Museum in Hyde Park gives up its efforts, citing the prohibitive costs involved in the operation. 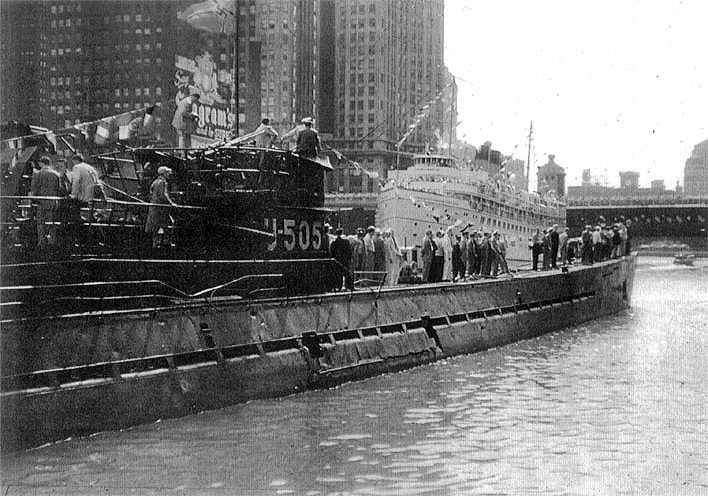 The U-505 finally comes to Chicago in September of 1954, as a result of a renewed effort on the part of the museum. The photo above shows the U-boat just east of Michigan Avenue as it arrived it the city in 1954.